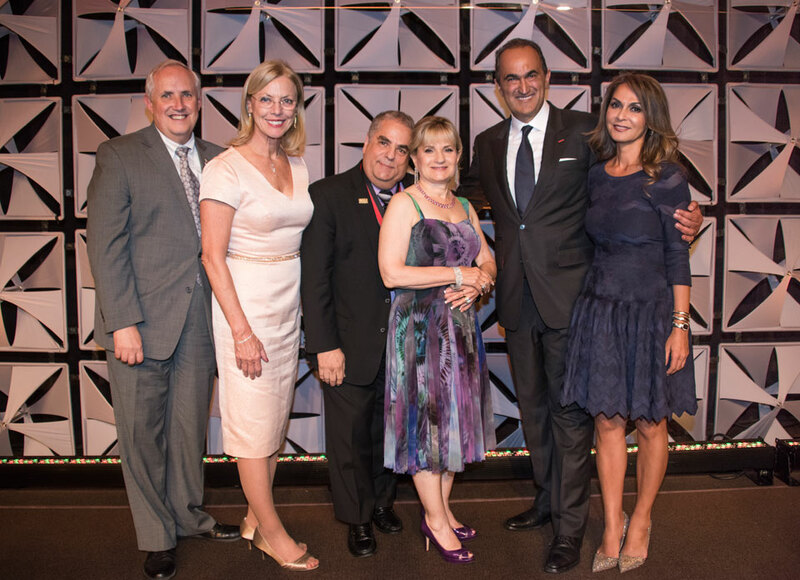 From left, Nazarian College Dean Kenneth R. Lord, CSUN President Dianne F. Harrison, Harvey Bookstein, Harriet Bookstein, David Nazarian and Angella Nazarian at the business college's 50th anniversary celebration at which the $5 million gift from the Booksteins was announced. Photo by Lee Choo. In recognition of the Booksteins’ commitment to CSUN, university officials plan to ask the California State University Board of Trustees to rename Juniper Hall, which houses the David Nazarian College of Business and Economics, to Bookstein Hall in their honor. 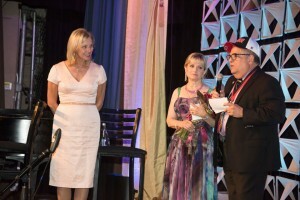 While CSUN President Dianne F. Harrison (far left) and his wife Harriet look on, Harvey Bookstein tells the audience at the Nazarian College’s 50th anniversary celebration why the gift was made. Photo by Lee Choo. Harvey Bookstein said he couldn’t imagine not making the gift to CSUN. Harriet Bookstein echoed her husband’s sentiments. The Booksteins’ gift was announced by President Harrison on Sept. 22 at the Beverly Wilshire Hotel in Beverly Hills at a gala celebration marking the Nazarian College’s 50th anniversary. A portion of their gift will be used to support the Volunteer Income Tax Assistance (VITA) program. This program — which is led by Rafi Efrat, holder of the Bookstein Distinguished Chair in Accounting was created by a generous previous gift from the Booksteins — offers free tax-preparation assistance to low-income families and individuals. Their gift will also establish the Bookstein Distinguished Chair in Real Estate Endowment in the real estate program. The remaining portion of their gift will create the Bookstein Leadership Endowment to support the college’s highest strategic priorities. The fundraising campaign for CSUN’s business college launched in March 2014 when entrepreneur and philanthropist David Nazarian, founder and CEO of Nimes Capital, donated $10 million of his own money and pledged to help raise an additional $15 million for the college. The Booksteins’ $5 million gift helped the university reach the fundraising goal in only two years. Harriet and Harvey Bookstein at the 50th anniversary celebration for the Nazarian College. Photo by Lee Choo. Robert Gunsalus, CSUN’s vice president for advancement and president of the CSUN Foundation, agreed. 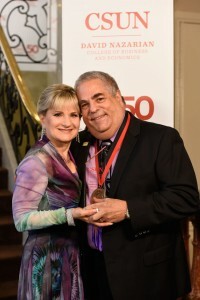 Active on several CSUN boards, Bookstein received CSUN’s prestigious Distinguished Alumni Award in 2009. He also received the Dorothea “Granny” Heitz Award for Outstanding Volunteer Leadership. Named in honor of the woman whose loyalty and school spirit made her a legendary figure on campus, the award is presented annually to alumni or friends who serve the university as outstanding volunteer role models and leaders. Earlier this year, Bookstein received an honorary Doctor of Humane Letters from the university, in recognition of his successful career and legacy at CSUN.